This welcoming pop-up store is in the touristic area of Sé which is an ideal location for brands to host a Pop-Up Store. This shop boasts a classic frontage with an inviting window display, there is an authentic feel with great visibility. This sharp pop-up store is bright with basic interiors with a brilliant atmosphere. This shop offers basic amenities including shelves, counters, and air-conditioning, which can accommodate a variety of pop-up stores. 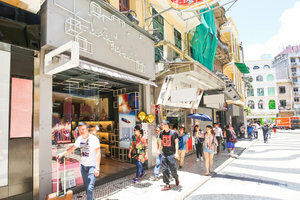 Surrounded by local eateries and located near Lou Kau Mansion, this pop-up store is great for brands and startups to bridge the gap between online and offline retail in a prime setting.